Like many Portlanders, City officials say they are concerned about housing choice and affordability. 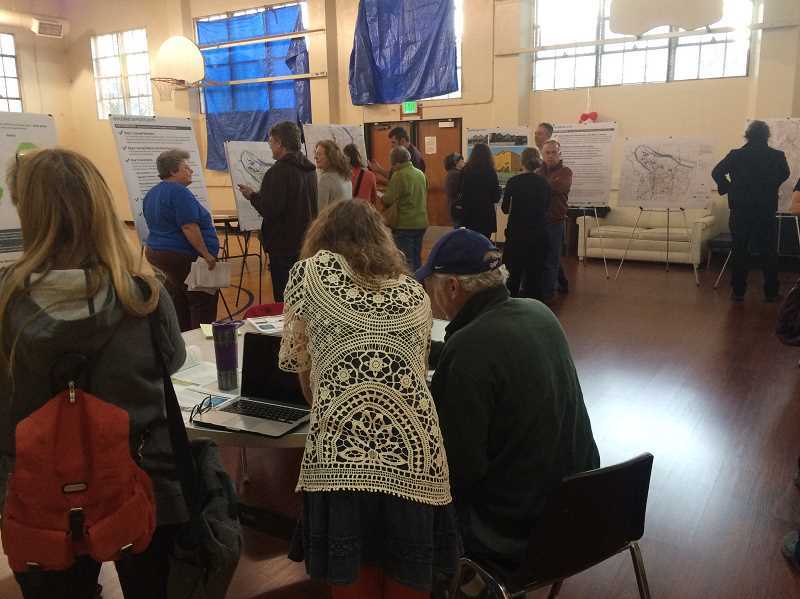 In late October, they invited the public to a drop-in informational session to hear about one way to address these issues: the Residential Infill Project. If implemented, the project's proposed regulatory modifications could change zoning policy in much of Portland, including a large slab of Southwest Portland. The Portland Bureau of Planning and Sustainability is currently in the public involvement phase of the process and will soon draft a formal proposal for the Planning and Sustainability Commission. The project's October discussion draft states that "the Residential Infill Project will help to incrementally increase the overall supply of housing units while maintaining the character of long-established single-dwelling units." According to the City of Portland's projections, Portland's population will increase by 40 percent by 2035, while the median home sale price rose by 44 percent between 2011 and 2015. Also, the average household in Portland held 4.2 residents a century ago, while only 2.3 residents occupy the average household now. And nationally, home sizes have increased from 1,000 square feet to 2,600 square feet on average in the same time period. To help the City deal with these changes, the project would provide more middle housing that is neither a large single-family household nor an apartment. Housing units that were once single-family households could turn into duplexes or triplexes, thus increasing housing supply. The City has prioritized adding more density in areas close to city centers, transit and schools. To make that happen, officials want to deter 1-for-1 development — where a large single-family unit is replaced with another large single family unit. The allowed size of housing would also change. Under the proposal, the maximum size of a house built on a 2,500-square-foot lot would decrease from 4,375 square feet to 1,750 square feet; the maximum size of a house built on a 5,000-square-foot foot lot would decrease from 6,750 square feet to 2,500 square feet; and the maximum size of a house built on a 7,000-square-foot lot would decrease from 7,650 square feet to 2,800 square feet. The plan would continue to allow two-and-a-half story houses. City officials also want to change the maximum height of houses. Instead of starting the height measurement from the highest point near the house, they would start the measurement from the lowest point. Also, in areas within what's called the "A overlay" zone, houses with two accessory dwelling units, duplexes, duplexes with one accessory dwelling unit and triplexes on corner lots would be allowed. Previously, triplexes were not allowed and duplexes were allowed only on corners. The City approximates that 3.5 to 5.5 percent of lots in the A overlay would utilize the more diverse development choices. The plan would also increase the maximum setback length and allow for a front setback reduction to align adjacent houses. To accommodate the growing elderly population, new developments would have to meet visibility requirements such as providing a no- or low-step entry, wide hallways and doors, and an area to socialize on the same floor as the bathroom. "What we're really trying to do is provide Portlanders with more opportunities not just to move into neighborhoods or downsize in a neighborhood, but providing housing choices besides apartments and big single-family residences," said Sandra Wood, a Portland Bureau of Planning and Sustainability representative. "Many neighborhoods only have big single-family residences, and if people want to downsize or if they get divorces or have to split households, there is no variety to housing stock. This we hope will provide some of that housing choice." But not all Southwest Portland residents approve of the idea. South Burlingame resident Robin Harman, who handed out flyers detailing her gripes with the plan at the drop-in public hearing, says the South Burlingame Neighborhood Association has come out against the plan. The Multnomah Neighborhood Association has also objected. A few Hillsdale Neighborhood Association members are generally supportive, but others worry about the ability of existing infrastructure to handle increased density. And Hillsdale resident Adam Light doesn't like how the public process has been conducted. Multnomah Land Use Chair Jim Peterson and Harman are both skeptical that the increase in housing stock will increase affordability. Indeed, Wood doesn't guarantee affordability for most Portland residents because the increasing price of land jacks up prices. "The fact is that our land itself is a lot more expensive. We're really not talking about affordability. We're talking about increasing housing choice, increasing housing supply overall citywide," she said. Still, Wood says, "By virtue of taking the cost of a property, one lot that would've been a house and one family and splitting that into two, by default that decreases the cost of the house because the cost of the land is being split in half." According to an economic analysis done by Johnson Economics LLC in 2016, the per-unit price of a single family unit is $750,000 compared to $431,250 for a duplex — implying that such a development change would be cheaper per unit but that the cost of the total development would be more expensive. The study also suggested that the plan would decrease the rate of development and decrease the value of land. To incentivize affordability, the City allows the development of one bonus unit if all other units cost 80 percent of median family income or lower. Harman is worried about the increased density evoked by the plan's implementation. She doesn't believe her neighborhood and much of Southwest Portland, which is lacking in sidewalks and features swelling traffic issues, can handle an influx of residents. "You're going to have people walking in the street. It's not safe. On the eastside, there are sidewalks everywhere," she said. Harman is amenable to increasing housing choice to a certain extent, but says this proposal is too aggressive. "I think they need to really rethink how aggressive this proposal is. It's incredibly aggressive. The map, it has to be close to two-thirds of the whole city. That's a pretty big experiment because it's not going to get undone once you do that," Harman said. Light likes the idea of adding more housing options and says Hillsdale, as opposed to Multnomah, could handle more density. "I think it's the right direction to focus on limiting the scale (of housing) and incentivizing something other than really massive development," he said. He says that changes to neighborhoods are already accelerating, and this project would just continue that trend. "If you have new development coming in, it could change the character of the neighborhood by allowing structures that look different than existing structures," Light said. "We've already seen these changes occur, and it's probably a continuation or modification of what is already happening." He generally senses that some of his neighbors, similar to Harman and Peterson, are open to decreasing the maximum size of houses but don't like the other policies that would accelerate change throughout the neighborhood. "In terms of my local neighborhood, they want it to stay as a single-family neighborhood. They aren't opposed to slightly smaller lots, but they don't want their neighborhood to become full of multi-unit, townhouse-style developments," he said. Peterson doesn't believe the City has adequately analyzed the impact the plan would have on infrastructure such as schools, roads and sewage systems. Also, he's frustrated the proposal doesn't address parking issues and wishes it included more nuanced zoning that adjusts based on the unique qualities of different lots and neighborhoods. "This is putting blanket zoning throughout the city," he said. "It's not good land use planning." Peterson and Harman also don't like that basements and attics are not included in housing measurements. "What we're concerned about is the bulk of the structure. If it's a basement, you can't see it so it doesn't contribute to that bulk and loss of character," Wood said. Peterson and Harman are also dissatisfied with the minnimum yard requirement of 12-feet-by-12-feet. "Basically what they're doing is zoning backyards where kids in my generation and your generation played," Peterson said. "What's happening to those people? Are they going to have to go to the park?" To Peterson, maintaining current infrastructure is the most affordable option because houses that are already built are less expensive than adding new housing. "Everything costs more to build now than what is already on the ground," he said. Harman also believes the planning process has lacked transparency and genuine public accommodation. "There needs to be a better public process. I think they need to inform everybody in writing of this. I think they need to be truthful. They try to spin the information all the time and not really show what it really means. It's not full disclosure. There's nobody taking minutes at this. This is checking the box, saying we did drop-in sessions. But where was it advertised?" she said. Light is more positive about the project but is also dissatisfied with the public process. He believes the City's public interactions are more like focus groups and less like collaborate exercises. "There's not really any dialogue between existing neighborhoods and developers and the City," Light said. "There's a public process, but I'm looking for something more dynamic so that citizens that want to make a difference can engage in creative problem solving."